The path of true research never ran smooth, or in a linear direction. Some of us make it to and through a PhD and then out of research, others leave academia, it’s really a relatively small number that ends up there. Life outside academia can be full of extraordinarily wonderful opportunities: for research, for building things, as our next curator’s amazing career shows. We are delighted to welcome Dr Joanne Kamens (@JKamens), Executive Director, of AddGene (@addgene), a not-for profit biological resource centre (BRC), to Real Scientists. Joanne trained as a geneticist at Harvard, after which she moved into pharmaceuticals and worked for BASF/Abbott for 15 years. She then went on to work at RXi and is now with AddGene. AddGene is a unique biological resource centre: like the American Type Culture Collection (ATCC), which is a repository of all the cell lines used in tissue culture: AddGene does the same for plasmids, the small DNA vectors that can be used to transmit information between organisms. It’s a great resource for scientists, you can read about it here at Nature. AddGene and the ATCC are just two examples of the kinds of resources scientists need to do their research. Adequately funding and maintaining these collections is also a major challenge in science policy. I usually think a scientist is something you are, not something you do. I was a young math geek (very unusual for a girl in Minnesota in the 70’s) and was good at science in school. As for many young people, I had a great 10th grade genetics teacher who encouraged me. I had my sights on Med School but one semester in college, and I knew it was the basic research science that had hooked me. I loved genetics from the start. It was so predictable and in college I took a grad level seminar on all the “classic” papers in the field of genetics. When I got to Grad School I did my research in a lab that focuses on molecular biology tools and tricks for research. My lab was one that developed the yeast two-hybrid system to use genetics to study protein interactions. My advisor was the first person to fuse to pieces of a protein together and show that both could work (seems so obvious in this day and age, but many told him it would not…it became a classic and famous Cell paper). Now at Addgene I get to think about molecular biology technology all day and I still love it. While in Pharma I did 15 years essentially as a molecular immunologist. Immunology is fascinating and complicated. I loved learning this field. Like all scientists I think, what drives me is learning new things. As long as I am doing that I am happy. Now I am the Executive Director of Addgene. That is like being the CEO in non-profit lingo. Addgene is a nonprofit dedicated to accelerating research and discovery by improving access to useful research materials and information. We fulfil this mission by helping scientists share plasmids (small useful circles of DNA) to collaborate. My work is awesome because the 40 Addgenies I work with are awesome and scientists all over the world love us. I will tweet more about Addgene, but we deliver plasmids to 78 countries currently at a rate of about 450 plasmids/day. Motivation: why should the lay public care about your research? I am addicted to New York Times Crossword puzzles. I read modern fiction and occasional nonfiction somewhat voraciously as time allows. Tough..I love my work so often a day off is finishing up some work stuff and then reading a good book in a beautiful place. I just got back from a vacation in Greece and the views on the islands of Crete and Santorini are indescribable. You can also listen to Joanne talk about her work on The Postdoc Way podcast. 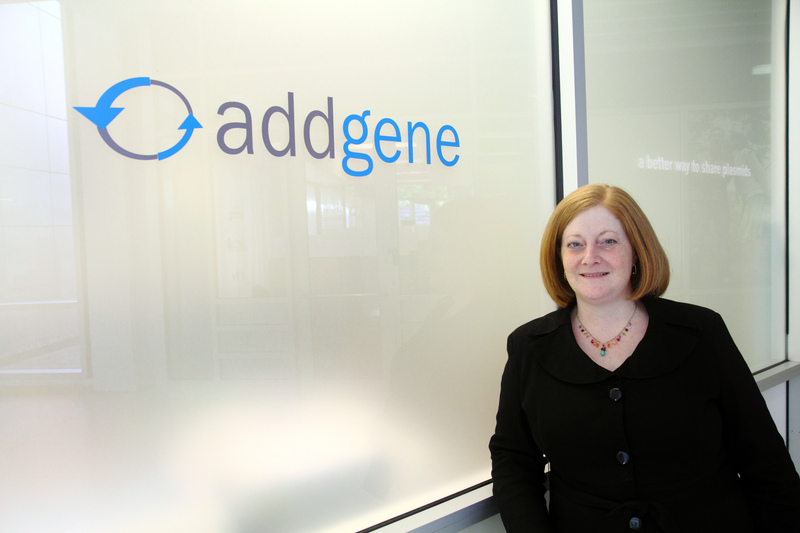 Please welcome Joanne Kamens (@jkamens) of AddGene (@addgene) to Real Scientists! Next story From farting cows to breast cancer research: Dr Anna Wronski, everyone!